Costs Differences between PACS | RamSoft Inc.
It’s been said that nothing in this world is free. Why then do some organizations buy into the illusion that a “free” open source PACS is a viable option? In reality, there are numerous costs associated with so-called “free” open source PACS. It’s important to look past the sticker price and consider the hidden costs when comparing commercial and open source PACS. Once these costs are brought to light, it is obvious that, in fact, open source PACS offer solutions that are far from free. Many open source PACS lack important features and functionality that can be found in commercial systems. Common downsides of open source PACS are poor ease-of-use and an increased strain on administrative and training personnel. In open source PACS environments, administrators spend more time configuring, and trainers invest more time helping end-users overcome a steep learning curve. Organizations that don’t employ sufficient PACS administrators and training staff may find it extremely difficult to even get the open source PACS off the ground. Due to the limited support provided from the open source development community, internal IT resources will be required to manage an open source system. This means that extra man-hours will be needed during the implementation phase and will continue as the organization supports the product. Many open source PACS lack sufficient supporting documentation which can make researching solutions to problems a nightmare. Additionally, the amount of resources needed to fix problems increases with open source systems because support personnel are forced to dive into the source code themselves. It is the nature of open source systems to allow the client community to have access to the source code of the software. In addition to facilitating a community of collaboration, this aspect of open source PACS opens the door for dangerous software bugs due to a lack of sound product management and QA processes. In the event of a critical issue, there may be no one to turn to for immediate help except your organization’s internal staff. Open source PACS are implemented with little or none of the contracts or service agreements that are generally available to protect your organization from harm. Maybe the largest cost associated with open source PACS is the opportunity cost. Most open source PACS do not come close to offering the amount of features that a commercial PACS does. 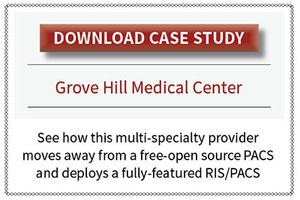 For instance, many open source PACS lack hanging protocol features, drastically reducing the radiologist’s productivity. Over time, this and other inefficiencies in the system generate a loss in productivity and will equate to thousands of dollars in radiologist payroll, which could have been used to generate more income by running more studies through an efficient system. The upfront cost should not be the sole factor when considering the overall cost of a PACS. Appreciate the value of development and support resources included with the PACS. Be aware that without any of the commercial PACS contract provisions you are assuming increased liability for your practice. Don’t forget to assess the opportunity cost to your organization by not taking advantage of the latest and greatest PACS features offered in the commercial PACS you are evaluating. When all-important factors are thoughtfully considered, it should be clear that organizations utilizing an open source PACS suffer from a higher overall cost when compared to the organizations utilizing a commercial PACS. It seems that the age-old adage is true: nothing in this world is free. Luke Bideaux, BSRT, RT (R), CIIP is an expert in Imaging Informatics and a leader in RIS/PACS education. He holds a B.S. in Radiologic Technology and professional certifications in Radiography (ARRT) and Imaging Informatics (ABII). Luke was trained in radiography at the Mayo Clinic and currently serves as the Clinical Applications Manager for RamSoft.